Against a backdrop of gleaming steel fermenting tanks, Jen Huston draws a beer for Joe Rowland at the Nantahala Brewing Company’s new tasting room, which had its grand opening Friday. 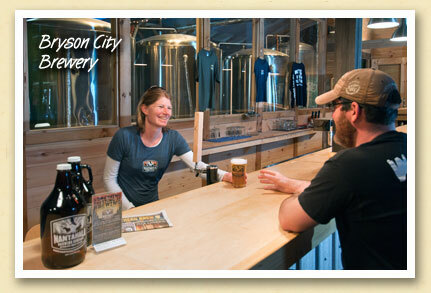 For several months, the Bryson City craft brewery has been supplying area restaurants with kegs of their IPA, Brown, Stout & Pale Ale and seasonal ales. And now, customers can enjoy the local brews at the 61 Depot Street brewery. Jen, Joe and brewers Chris and Cristina Collier are initially opening the tasting bar on Thursday, Friday and Saturday evenings from 4 pm to 10 pm and Sundays 2 pm to 6 pm, with an expanded hours April thru mid-November. For more information and hours of operation, visit their website. Bryson City is a fine place to visit. It is a quant old town, with friendly people. There is a train there that gives you a fantastic ride to the Nantahala George and back. Great childrens rides, trougout the year. If you don’t visit, you have missed a great treat. We’ve expanded our hours in March to Thursdays, Fridays and Saturdays from 4 pm till 10 pm and Sundays from 2 pm till 6 pm. Also, our address was recently changed to 61 Depot Street (numbers are on the front door). We hope to see everyone soon!